I can’t take credit for the view, but I will own up to shamelessly taking advantage of it. When we built our house here in central Colorado, we designed it so that our offices—the rooms in which we are most apt to spend daylight hours—occupy the top floor. The two rooms of this aerie afford a 360-degree view from their windows. When I’m working at my computer, oriented toward the south, I can look over the screen and see all the way down to the Wet Mountain Valley, with the Sangre de Cristo mountain range serrating the horizon. 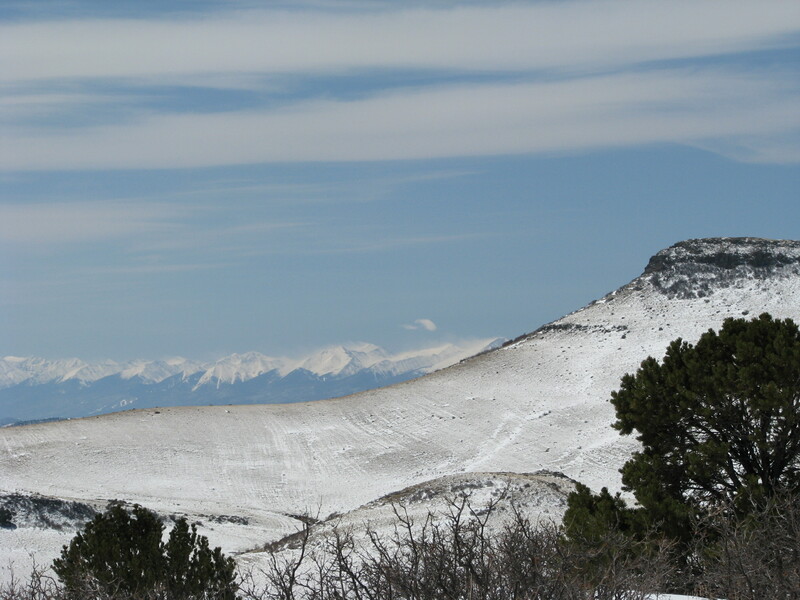 In the middle distance, a formation called Cap Rock Ridge clips off the vista of the Sangres with a rocky butte, then stretches its undulating profile all across the western perspective. Continuing around to the north, the landscape tumbles around in a complicated array of grass and rock outcrops and piñon scrub, with several more rock-capped buttes accenting the seam between land and sky. The squat cone of Pikes Peak fills the east-facing window of my husband’s office. All of which is to say that the “wild” part of being between urban and wild is pretty easy to account for. At first glance, the “urban” aspect sounds delusional, since the nearest town of any size is thirty miles away, invisible in the wrinkles of the landscape, and I can count on one hand the houses within a one-mile radius. When you boil down the definition of “urban,” though, the thing most fundamentally characteristic of a city is the presence of people—people and the infrastructure associated with them. In the context of the stories that assemble here, then, I am the representative of the urban: me, the house my husband and I live in, the barn we built for our horses, the scattered homes of neighbors, the roads and vehicles we use to access this place, the lines draped along the electric service poles, my computer and the other technologies that link me to the intellectual web of the wider world, including words collected in hard-copy forms. Because I live in a place where the land is such a powerful force—and given that an interest in natural history inclines me to submit to its attractions—it seems worthwhile to acknowledge up front the fruits of human ingenuity that enable my existence here. There are costs, too, of course. In a place that is more wild than urban, living a lifestyle reliant on modern conveniences inflicts environmental and social burdens, some of which are different in type and degree than those inflicted on the world by someone who lives in town. That’s part of the story to be told here, but only part. Mostly, this blog is a chronicle about my experiences of living in this particular place: stories about the land, the animals, the weather, the plants. It’s intended as a collection point for observations about the events—sometimes large but mostly small—that tug at my attention when I look out the window or take a walk outside. That I can live in a remote area and still participate in the intricacies of modern human society is no small thing. That I can look up from working at my desk to see a golden eagle coursing along the ridge top on a thermal of mountain air, its feathers flexing and separating at its wingtips, is a source of considerable gratitude on my part. Just as I can’t take credit for the views, I can’t take credit for the technologies and inventiveness that support my lifestyle. Endeavoring to write about the former by way of the latter is a small gesture toward honoring both. This entry was posted in home, observation and tagged Colorado, wildland-urban interface. Bookmark the permalink.